Transaction Structure – $54.0MM Senior secured first lien notes, $15.0MM of cash equity from IPR Group. 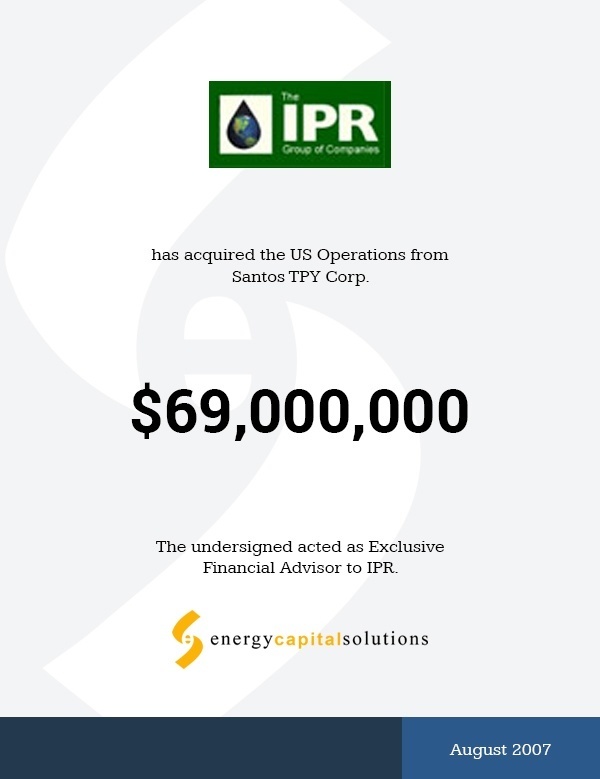 June 1, 2007 – ECS was engaged by Improved Petroleum Recovery Group of Companies (“IPR” or the “Company”) as its exclusive financial advisor to advise the Company on the acquisition of Santos USA Corp.
July 1–7, 2007 – ECS received mandate to proceed with transaction. August 13, 2007 – Transaction closed into escrow, pending completion of a well. August 31, 2007 – Escrow was released. Strong Financial Sponsorship – Guggenheim provided the financing for the transaction in the amount of a $54.0MM Senior secured note. Quick Execution – ECS was able to secure financing from Guggenheim and execute the transaction in 3 months from Engagement to Pending Close.